You are very inspirational and kind-hearted, but you have your own strong principles and ideas. You are ready to refuse from some conveniences in your life, in order to be happy or bring happiness to others. You are a type of person that can be so much impressed that quits work and goes volunteering. Such people are able to see deeper, and problems of ecology, society structure and politics really matter for them as they feel themselves a part of something bigger. You appreciate aesthetics around you and try to make surroundings more appealing. It may be manifested in the sense of order, designing your or others interiors, artistic feel and excellent color choice. Your inclinations to order and beauty can be useful in combination with self-confidence in professions of power: managers, organizers, attorneys, social workers and so on. You believe that if the person has a high aim and strives for it, this person can reach the peak in life. You are a perfectionist to yourself and to the world around. That's why you try to help, in order to "fix" the inconsistencies and shortcomings of our world. You are a creator of harmony. Naturally, you are non-conflicting person, but if someone pushes on the painful topic, you can become furious. You can't stand still, you're in need of action. You willingly develop your talents and share experience with others. However, you often forget that there is no limit to perfection, and you can't reach it and in continuous rush to be better you skip pleasant moments in your life. Sometimes you aren't ready to face the problems, and you go inward, being infantile. Your love can be somewhat intrusive, but it is really sincere. Don't be afraid about your mistakes, think that mistake is a part of success, and learn from your mistakes, but don't blame yourself. In the relationships you are very dependent, you need to give everything you have, all your efforts to the partner. But not every person estimates such behavior right, some may use you, some may ignore your efforts. Anyway, it will hurt. Stop loving everything around except yourself, make an input in yourself and you will be independent and ready to stand for your position. 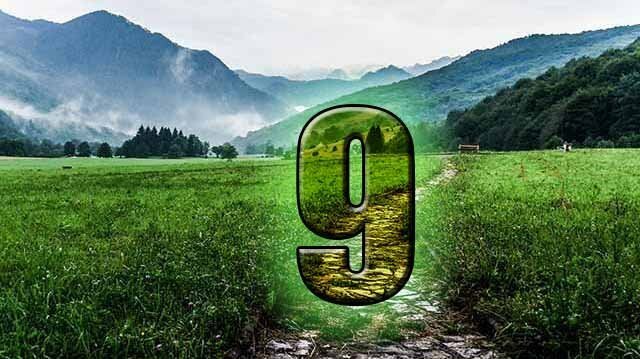 However, number 9 has a great possibility to be really wealthy. Usually sudden finances fall on such people, and this money should be invested in something that you're dreaming about, for your future fulfillment or in something that inspires you. If you want to make money for money - the fortune will fade away and it will be hard times for you. You love to be useful, you feel completed when you are busy with something important. If your work brings you pleasure, you are the most inspirational worker and you prove yourself to be a professional. You are concerned about the life of others and it influences your social position. By helping others you boost your self-esteem and feel in the right place.